This issue starts an article about boat camping. The 15sep02 issue will complete it. THE 11TH ANNUAL LAKE MONROE (BLOOMINGTON, INDIANA) MESSABOUT will take place on September 20, 21, and 22 at Lake Monroe's Paynetown State Recreation Area. For more information contact Bob Bringle at rbringle@iupui.edu. I hope to be at this one. THE LAKE CONROE (HOUSTON, TEXAS) MESSABOUT will take place on September 28. I plan to be at this one too. For more information contact David Routh at shorty@shortypen.com or check out his website. Barry Johson has a website about his Toto. Here is an article I wrote for the great paper magazine Messing About In Boats back in when I was getting started and long before I got on the internet. Back then Bob Hicks was putting the magazine together by himself every two weeks using a Radio Shack generation one computer with a daisywheel printer. The essay is ten years old now. Since I wrote it I've done a lot more camping in my AF4 powerboat but I'm not going to update it for that experience. Instead here is the 1993 essay unchanged. A few years ago the State of Illinois built a hotel which looks over one of the large manmade lakes here. Folks get to walk in the woods and see the beautiful sunsets for $60 a night. For years I'd been doing that for free. I could even relocate my waterfront propery at will. I was boat camping. There's nothing new about boat camping. Right after the Civil War, Nathanial Bishop spent months circumnavigating the eastern US in a 14' canoe (which he rowed most of the way)and in a duck hunter's sneakbox. Modern boat campers can be every bit as ambitious as Bishop, but I'm going to propose something less strenuous for the common man. It's more of a first step that you can build upon. To me boat camping is simply camping in a boat. L. Francis Herreshoff called this "beach camping" and was a great fan of it even though he made a living designing yachts for millionaires. 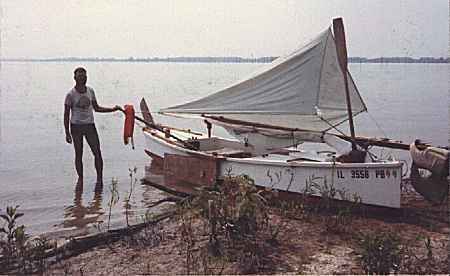 The design he called his Beach Cruiser, a 14' dinghy shown on page 88 of his COMPLETE CRUISER, has the basics which I tried to stick into my little sailboats. Foremost is a spot big enough to sleep in. That is a clear space 6-1/2' by 2', but I've camped on the floor of a solo canoe whose bottom plank was only 11 inches wide. My air mattress pretty well filled the canoe. I had to get up and out of the boat at night to roll over (Nat Bishop had the same problem), but I was able to spend the night sleeping, more or less. For camping two you'd think that a space 6-1/2' by 4' would be required, even though some of the double bunks in some yachts are smaller than that. 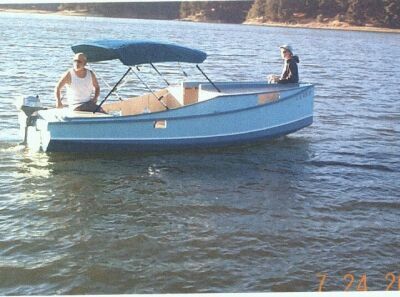 My first real camping boat was a Bolger Jinni, a flat bottomed yawl, 16' long and specifically designed for camping with a 6-1/2' by 4' flat cockpit floor. The wife and I camped in the Jinni quite a bit but it is chummy. It's like those "two man" tents that are great for one. If you want to sleep two men, better get a "four man" tent. I should tell you sleeping head to foot makes for less interference for sleepers. Better wash your feet before turning in! Maybe a 13' x 2' clear space is better. Sleep foot to foot. For a sailoat the use of leeboards, external daggerboards or external pivoting boards will eliminate the clutter caused by a centerboard or daggerboard case. These leeboards may be ugly from the observer's point of view but from the user's point of view they are efficient, out of sight, and out of mind. You can't have a large external keel or deep V bottom because you need to beach the boat flat, as Herreshoff did. He used inflatable tubes as rollers to bring his dinghy up to dry beach. For solo camping a suitable boat might weigh 100 pounds or less and rollers aren't really needed. I never could find rollers and they might just sink out of sight in the mud we have around here anyway. For heavier boats, such as my Jinni, I'd pull the bow as far up the shore as possible. Usually the hull is about half in and half out of the water. It's all I can do but has real disadvantages compared to a totally beached boat. For one, getting out of the sleep space requires climbing over the bow (or stern - sometimes it is best to beach stern first) and often a step over the side onto dry land, as you can do with a totally beached boat, is perhaps the biggest advantage of this sort of camping. Once ashore even a twelve footer has more "deck space" than the largest yacht. And it is solid deck, too. There's no pitching and rolling to contend with, but that is not true with a half beached boat. One night I had Jinni half beached on a quiet lee shore to our southerly summer winds. During the night a north wind blew in bringing choppy waters which made noisy slaps against the hull and physically lifted and dropped the stern onto the bottom every few seconds. For me there was no sleeping in it and I tied a pocket hammock between two trees for the night. I came back a month later and found the beavers had eaten my hammock trees. A totally beached boat can be pulled up high enough to avoid worries about waves and tides. We don't have tides where I live but I've seen the lakes go up and down several feet and day and the rivers a foot an hour. I once had a Birdwatcher tucked onto a shore and settled in for the night. About 5 AM I awoke to do some business and found myself far more disoriented than normal. The lake had her and I was drifting free a quarter mile from my camp site. Luckily there was almost no wind. Even a half beached boat needs to be tied down. I prefer a hull with a plain bottom plank armored with fiberglass and with no rub strakes, external or internal stiffeners or even a skeg, if possible. 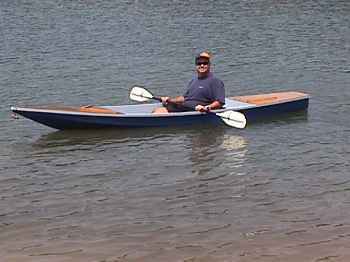 A light flat bottom hull with good rocker can be slid over mud, sand, grass and gravel like a sled. Bottoms like this usually need a little help from a leeboard to go straight. Canoes and rowboats always seem to need at least a skeg to go straight. And don't underestimate the ability of a canoe or rowboat for boat camping. In fact, I maintain that a light rowboat is the optimum. For $150 a hull such as my Roar or a Bolger dory can be built which has clear space needed to sleep one plus enough storage volume in the ends to keep all your gear on board while you sleep. They will weigh perhaps 75 pounds empty if you keep weight in mind while building. They are a snap to solo cartop or slide around on a beach. There is no sail rig to build or stow. In truth, once you've got rowing down, these boats will take you almost anywhere faster and safer than a sailboat. Admittedly, if I lived on the Gulf Coast and could sail the protected waterway on a reach for months at a time I'd have a sailing camper. On narrow streams I'd have a canoe. Once you get involved in this, you'll have one of each! You know, people who "anchor out" can miss a lot. Late one afternoon I saw a skiboat, very low in the water, quickly pull up near my spot. The worried skipper had with him a crew of three young lovelies all wearing those tiny tight things young women swim in. The captain immediately went to the stern and suffered to find the leak. I was going to help until I saw his beautiful crew bailing the boat, straining and bouncing to and fro. For a final performance they all three bent low and, with every muscle in perfectly poised prominence, thrust the heavy boat free of the shore. I was satisfied just to watch. It was better than TV. No matter how you beach, never take a conventional tent, I say. Where I live setting up a tent will bring out the shore patrol in seconds and you'll be sent home. You see, I'm not certain that boat camping is totally legal except in unusual places like the Land Between the Lakes in Kentucky/Tennessee. I suspect that the entire world has a "No Camping Except In Designated Areas" rule. And the fact is that if everybody did it, I'd stop doing it. To me boat camping is a getaway, something nonsocial in nature. So I'm secretive and discrete about it. If I've spent a night camping in my boat and nobody else knows about it or can tell I was there, I've had a success. Just the same, I'm in the habit of having a valid fishing license and some minimal fishing gear such as a telescoping fishing pole. Sitting on shore and fishing all night is totally legal and so is snacking and boiling a pot of coffee. "Just fishing," I'll tell the agent. "Good luck," he'll reply. "But don't fall asleep. That's illegal!" ...the end of the boat camping essay. Shanteuse is a slight enlargment of the mini shanty Harmonica. 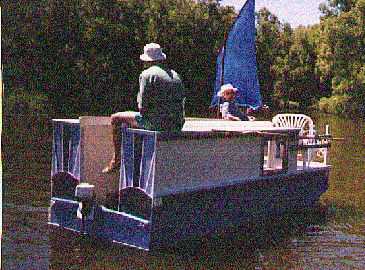 Shanteuse is 1' wider than Harmonica and has a 3' extension on the stern to allow a small back porch and a motor mount that is totally out of the living area. I've also made Shanteuse a little heftier. I'm thinking this one will weigh about 700 pounds empty where Harmonica comes in at around 400 pounds. I'm not sure if the extra beef is needed because Harmonica seemed totally adequate to me as far as strenght and stiffness go. But the extra size of Shanteuse is probably going to take it out of the compact car tow class. The plywood bill for Shanteuse looks like six sheets of 1/2" plywood and eight sheets of 1/4" plywood. I would not use fancy materials on a boat like this and am reminded of Phil Bolger's warning to never spend a lot of money building a design that was intended to look cheap. I see pine exterior plywood at my local lumberyard selling for $11 or a 3/8" sheet and this entire boat could be built of it. So the plywood bill would be less than $200 and I'm thinking the entire bill less than $500. The pine plywood looks quite good to me, its main drawback being that it doesn't lay very flat. These boats can be very comfortable to camp in. The interior volume and shape are not unlike the typical pickup camper or the volume in a full sized van. It's not huge, it's cozy. The top has an open slot 28" wide from front to back on centerline. 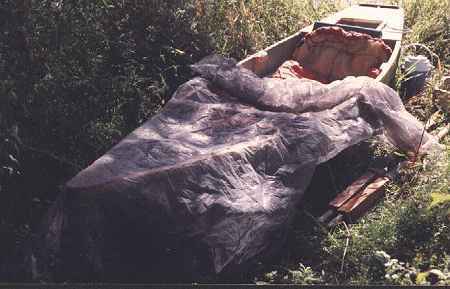 You can close it over with a simple tarp, leave it open in good weather, or rig up a full headroom tarp that covers the entire boat. I've shown lots of windows but the window treatment can be anything you like. Chris used very small windows on the original Harmonica and I thought it quite nice. You do need to see out. I would be tempted to cover the openings with screen and use clear vinyl covers in the rain or cold. For hard windows I think the best material might be the Lucite storm window replacements sold at the lumberyard. Easily worked, strong, and not expensive. As for operation, these are smooth water boats. So it is best to stay on small waters that never get too rough. On bigger waters you need to watch the weather very carefully. For power I would stick to 5 or 10 hp but I'm very much a chicken about these things. 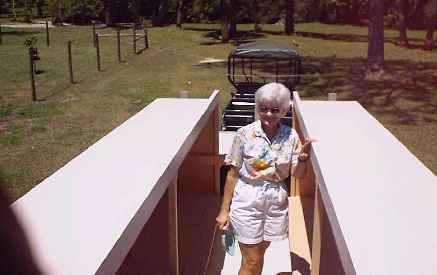 To my knowledge no Shanteuse has been built to the plans but Vince SantaMaria in Florida built one that was stretched to 24'! 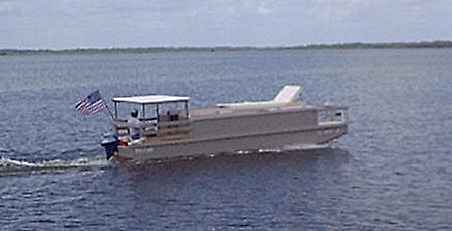 Here he is on trials with a 25 hp motor for cruising Florida rivers. He said the long boat went 11 mph at full throttle and about 8 at a very smooth and quiet half throttle. I should add that a boat of this size can swallow up an awful lot of gear and that weight can have a large effect on performance. Here is a photo of Vince's boat showing a bit of the interior and size. Note that Vince's boat is longer than the blueprint Shanteuse but has the same width and depth. Plans for Shanteuse are still $20 until a 16' one is built and tested.